CD players use infrared lasers, which aren’t deflected much at all by shallow surface scratches. A scratch deep enough would be impossible to just polish away. I’ve had several discs scratched to where they wouldn’t play properly, even after thoroughly cleaning them. I ended up buying a disc polisher from the local electronics store that did a fairly decent job. It was pretty costly and would sometimes take several passes. Bottom line, scratches can be deep enough to cause skipping, yet shallow enough to polish away. I’m more concerned with keeping the label side protected since there’s a very thin layer of protection on it compared to the shiny side. A dirty disc is different from a scratched disc. Light is light. Refraction is refraction. Don’t matter what the color of the light is. The size and spacing of the data tracks on a DVD is mind-numbing. I believe that the smallest scratch can cause a data disk to fail. If I had a bag of 4.7 billion 1 inch marbles, black and white (0’s and 1’s), and had to place them on the ground in the proper order, how far would I have to walk to empty the bag? Answer: Over three times around the equator. Oops. That white marble you placed in Ecuador on the second pass should have been a black marble. Disk fail. Proper disk handling and storage is critical to preserving data. This machine can be used as another tool to preserve your archives. That’s very nice, but different wavelengts of light are diffracted differently. It’s a problem in photography, where it’s called chromatic aberration. Little surface scratches are practically transparent to infrared light. And what people usually refer to as clear plastic polishing compounds are actually wax or a similiar coating material that fills in the surface scratches. And optical discs have error correction. There are kits out there that starting with very fine sandpaper for such scratches, you work your way up the finer grades then to a polish. Tedious, but it does work. Adding to @josh says, if you scratch the label side then you might as well throw it away. I’ve used a hand cranked version of this device and can say with first hand knowledge that the polishing process can fix most scratch problems. The one thing I wonder about is whether enough heat could be generated during high speed polishing to soften and further damage the plastic surface. Perhaps a simple timer added to the motor circuit would help prevent damage from bored users. Kudos to Wotboa for his imaginative thinking! Thanks for the compliment, but genius is a (teeny tiny) bit high. The only reason I posted it now is because it was in need of a tune-up. As it was reassembled I was able to get a full set of photos of the build. The full build is on instructables.com. As the machine sits, it is not marketable. It’s a tinkerers toy that requires occasional fiddling with. If (if) I had the money, I would bring it to market. That would require a machine you could just plug in & go. This ain’t it. So here it is, naked to the world. I hope there’s a hundred of them built and posted online by August. 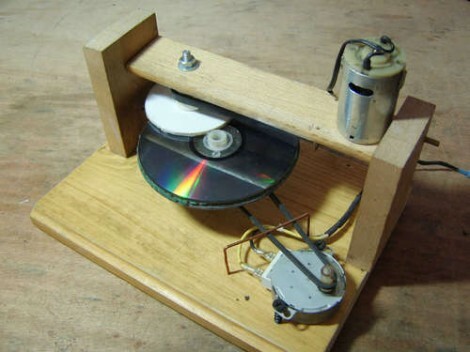 Used to polish cd’s on a buffing wheel. The hard part is figuring out what combinations of rouge and cutting compounds to use on plastic. One problem I see with this design is coverage; the radius of the buffing disc doesn’t seem large enough to allow it to polish the entire surface of the disc. At the end of the video it seems that only the middle area of the disc has been polished. I’m not sure how much of the disc a drive will need to read, but it seems like polishing the entire surface would be important. Perhaps using a softer material for the buffing disc so it can compress more and get the entire disc? For the commercial products I’ve seen the use a large flexible wheel to cover the entire disc. You don’t polish a cd all at once. You need small circles as you move around the disc. So you still buff it, just less at once. You are right about getting the pad to polish the disk across the whole surface. When I first built the machine, I was using a stiffer backing, and a single piece of felt. I could not get the scratches on the outer edge of the disk. My revision included a thinner backing pad, and several small pieces of felt to keep the pad flexible. After that mod and fine tuning the shaft positions, angles, and pressure, it does indeed cover the disk from side to side (perhaps the video doesn’t show enough detail). PS there is an instructables link at the top of this page to view the build. This is good for pressed media, but the claim of “may save your backups” is off base. The only time you’re handling a backup is when you create it, put it in storage, or do a restore. Your real risk is degredation of the ink layer or shoddy manfacture, neither of which will be helped by polishing. The video is features polishing recordable media, not pressed. I found plain old beeswax is a pretty good medium for filling scratches in DVDs, as opposed to polishing them out. Seems to work ok for me. I just smear it on, let it go hard then buff it up. I guess the refractive index must be quite close to that of polycarbonate or something. I found that small scratches on CDs can be effectively filled with oil (don’t laugh). Just put a little olive oil on a piece of paper towel and rub it on the disc. I used this method to recover audio CDs that were lent to many people and acquired moderately severe scratches in the process. I didn’t look it up but I guess it works because the refraction index of the oil is close to the one of polycarbonate. If any one bit (or even several bits) are unreadable, the built-in error correction code (ECC) provides enough redundancy to recover the lost data on the fly. No disc fail! And this actually happens frequently, even on what may appear to be a flawless disc. The problem is when you overwhelm the ECC. This can happen especially when there is a scratch going in the same direction as the track, so that a long segment of data is unreadable. Even a shallow scratch can cause problems in this case. That’s why you should always clean discs by wiping from center to edge, so that any scratches you create won’t be an issue. Discs can be often repaired when this happens. I used to work at a video store which had a monster of a disc polisher, about one foot square, with a heavy acrylic case to block noise and the polishing compound it slopped all over. I don’t know what people were doing to their DVDs for some to come back with so many scratches, but the polisher was usually able to fix them. I’m careful with my own discs, but sometimes accidents happen anyway. Most have been due to drives with oversensitive switches in the tray, that can cause them to close unexpectedly. Which may happen before you get the disc properly seated, causing it to be jammed in the closing mechanism and scratched. Beeswax or olive oil to fill in a scratch? Sounds like it would work, but you do run the risk of the fill substance coming off and falling onto the laser pickup; which will render it inoperative until cleaned. There are some acrylic scratch fillers that claim to cure like epoxy for a permanent repair. I’ve heard some success stories about them, but haven’t tried any personally. As for this DIY polisher, I hope the picture shown on step #10 isn’t a normal result. It looks frosted, rather than smoothly polished. And there also appears to be a spiral effect in the reflection, which would indicate that uneven pressure is being applied during polishing. And as we progress with technology, we have shifted from near infrared with CDs to visible red (DVDs) and now we are shifting to BluRay… so as our technology evolves so does the diffraction claim. Anyways, after having little girls pillage through their DVDs and trying to replace limited issue movies, you will learn to appreciate what the Disc Polishers can really do.